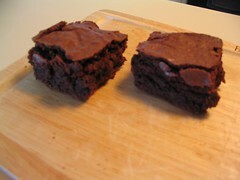 Unsatisfied with the last brownie recipe I tried, I stumbled upon this one while browsing desserts online. This is what happens when I don’t feel well…I scour the Internet for recipes to try when I’m feeling better. And feeling better I am, so here they are. Some of the reviewers declared this recipe to taste like box mix brownies and they do! They’re chewy and moist, and much more cakey than fudgey. They are delicious. Unfortunately, the top cracked miserably and they didn’t cut well, even when fully cooled. I’m not sure what caused that to happen. In a large bowl, blend melted butter, sugar and vanilla. Beat in eggs one at a time. Combine the flour, cocoa, baking powder and salt. Gradually blend into the egg mixture. Spread the batter into the prepared pan. Bake in preheated oven for 40 to 45 minutes, or until brownies begin to pull away from the sides of the pan. Let brownies cool, then cut into squares. Enjoy! Notes: The original recipe is different–I heeded the suggestions of many reviewers and omitted the baking powder and used only two eggs. Also, mine were done in about 35 minutes. I became suspicious when I found that this allrecipes.com recipe was the same as in my grandma’s cookbook…and all over the internet. I think it originated as a Hershey’s recipe (or at least now is). I think there’s a Seinfeld episode about that! Fantastic ! Really yummy , mine were done in 25 mins & are a great texture & flavour , easy as to make . A great brownie !